File contains a video recording of Budge Wilson receiving the Order of Canada from Governor General Adrienne Clarkson. File contains correspondence and itineraries regarding Budge Wilson's appointment to the Order of Canada on March 11, 2005. File contains a letter from Adrienne Clarkson to Budge Wilson thanking her for sending a copy of her book "The Leaving" and congratulating her on receiving the Order of Canada. 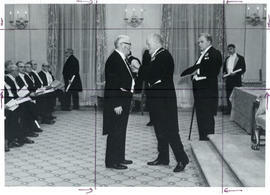 Dr. Carlton Lamont MacMillan receiving the Order of Canada from Governor General of Canada, Roland Michener. 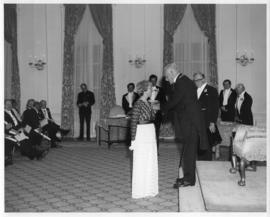 Item is a photograph of Sister Catherine Wallace, past president of Mount Saint Vincent University, receiving the Order of Canada in Ottawa, Ontario. The photograph shows Hon. Daniel Roland Michener presenting the award to Wallace.